If you read Jules Verne’s book “Around the World in Eighty Days” (or if you seen film based on this novel) you probably remember Phileas Fogg – the main character, rich and generally remarkable man who had one passion. He loved to play Whist. What the heck is Whist? From the book you can easily guess this is a card game, but… what this game really is? Why it was so good for man like Phileas Fogg? Is it really intellectual challenge? Whist is a card game popular in 18th and 19th centuries. It derives from a much older 18th century game called trump. And Whist is also ancestor to other interesting and popular games like contract Bridge or Preferans. Whist relationship with Contract Bridge is not only about the origin. 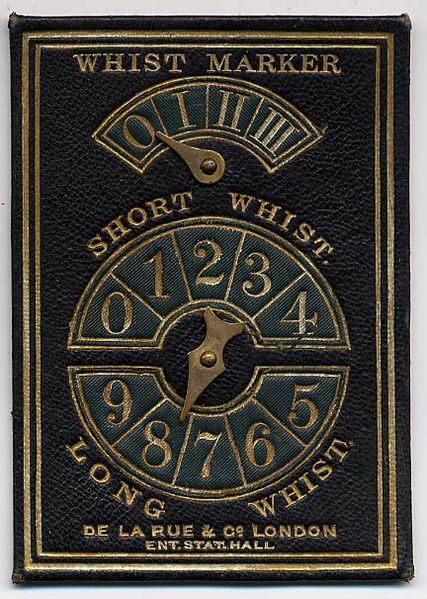 Whist evolved in circles of gentlemen and was considered a mind sport. In the book “Around the World in Eighty Days” we read that Phileas Fogg played for money. Don’t be fooled by this. Whist was not a gambling game in todays meaning. In 19th century even chess games were often played for money, it was fashionable even. So the mere fact of winning any sums doesn’t means that the game served for gambling. In 1862 Whist rules were codified by Henry James, an expert on card games known under the name “Cavendish”. Other authors also wrote about Whist. You could say that Whist had a similar role as the Bridge today – it was a card game, but aspiring to the role of serious mind sport, with its own special theory and terminology. Of course different variants of Whist emerged. Bid whist, Boston, Hearts (it has nothing to do with hearts known from Windows), Jass, Serbian whist, Russian Whist (very similar to bridge), Tarneeb (known in the Arab world), German Whist, dummy Whist, even Israeli Whist. And it’s just part of the known variants, even not more than half. One question arises – which Whist variant could be played by Phileas Fogg? I see two possibilities. Maybe Phileas Fogg knew the simplest version of the game. Alternatively, he could play so called Solo Whist, which was particularly popular in the 19th century in England and today is known in UK, Australia and New Zealand. Interestingly, Solo Whist probably derived from Jewish groups. I do not know which option to choose. So I decided to describe the simplest version of Whist. And I described Solo Whist in another post. Whist is a game for 4 players. A pair of players plays against another pair. Wining tricks is a goal of the game. To play whist you need a standard cards deck with 52 cards (from aces to twos). Whist is a game for 4 players. In a standard version, two people play against the other two (as in Bridge). Partners sit opposite each other. Pairs are determined by cut or draw cards. Partners can’t communicate. It is not allowed to comment on cards in hand. Dealer always has the right to shuffle last. Sometimes there are two card decks. The second is shuffled by the partner dealer and is waiting for the next hand (to speed up dealing). There is cards rank in Whist. The highest card is an Ace, then King, Queen, Jack and spots. So rank from the highest to lowest is: A, K, Q, J, 10, 9, 8, 7, 6, 5, 4, 3, 2. The dealer deals all 52 cards, faces down (starting from the player on his left). Each player gets 13 cards. The last card goes to the dealer, who reveals it. This card determines the trump suit. The turned-up trump card remains on the table until it is the dealer’s turn to play to the first trick. A table just after dealing. North player is a dealer and last card was 9♠. This card determines spades (♠) as trump suit. The player to the left of the dealer plays first (we say he leads to the trick). Then subsequent players play their cards (clockwise). They must follow suit by playing a card of the led suit. Only when player has no card of the suit led, he (or she) may play any card. Four played cards form so called trick. The trick is won by the player who played the highest card in the led suit. The exception is when someone played card in the trump suit. Then the trick is won by the player who has played the highest card in the trump suit. Spades (♠) is a trump suit. South player led with A♥. Trick will be won by East player who played highest card in trump suit (5♠). Note: You can play card in the trump suit only if you don’t have a card of the suit led. You always have to follow suit if possible. Only when you have no card of the suit led, you can play trump. Playing with higher card to win trick is not mandatory. You can play low card to keep a strong card for later. Taken tricks are property of two players who play together. Play continues until all thirteen tricks are played. Note: Cards collected in tricks lie on the table faces down. Each player is allowed to view only the last trick, but the rest of the cards is to be concealed. It is associated with one important skill in Whist – you have to remember cards have been played. A pair of players scores 1 point for each trick taken over six tricks. So if the players took 8 tricks in total, they get 2 points. The game is over when one pair reaches 5 points. There are also longer games to 7 or 9 points (so called Long Whists). Usually when players are experienced, the hand did not end up getting more than 2 points. There are interesting gadgets you can use playing Whist – Whist Markers. They were used to count points. You can see one marker on the image below. Is it not too simple? No! If read this article you can come to the conclusion that… something is wrong. This game is really simple. Rules can be learned in a few minutes. There is no bidding. Is this really a mind sport of XIX century? Well… in the world of games it often happens that simple games are a big challenge. Everyone who plays Checkers, Go or Othello knows it. Some games are simple to learn, but not easy to win. Whist players developed special terminology. They also developed some strategies, like getting rid of the single card in suit to quickly play trumps or discards low cards of an unwanted suit. In whist you can also use playing techniques known from Contract Bridge like the finesse. It’s not possible to write about this in one short blog post. Personally I think Whist should be interesting for those who would like to learn to play Contract Bridge in future. Whist is easier and allows you to understand the mechanics of similar game. And Whist is somehow more entertaining than the Bridge, ideal for playing with friends, who are not Bridge experts. Worth a try. Looking for a card deck? If you need a deck of cards, I recomend Piatnik or Cartamundi cards. They are really nice and by buying them you can support creator of this blog.